Carpenter Brut And Seth Ickerman Reunite! Watch The BLOOD MACHINES Teaser Now! It was just a little while back that French directing duo Seth Ickerman - Raphael Hernandez and Savitri Joly-Gonfard - teamed up with synthwave phenomenon Carpenter Brut to create the music video for Carpenter Brut's Turbo Killer. The results were frankly astounding, a gorgeous, retro inspired, vfx heavy affair created in the directing duo's garage and it became a phenomenon online. Jump forward a bit to 2017 when it was announced that Seth Ickerman and Carpenter Brut would be reuniting for Blood Machines, a short film project that they successfully crowd funded 185 thousand Euro on Kickstarter. That project has now grown well beyond its original bounds, with Kung Fury helmer David Sandberg joining as an EP and the final result requiring more than 400 vfx shots. But it's almost here. BLOOD MACHINES follows two space hunters tracking down a machine trying to free itself. After taking it down, they witness a mystical phenomenon: the ghost of a young woman pulls itself out of the carcass, as if the spaceship had a soul. Trying to understand its nature, they start chasing the woman through space. While work continues the first teaser has arrived online and it's as gorgeous as you'd expect and hope for! Take a look below! 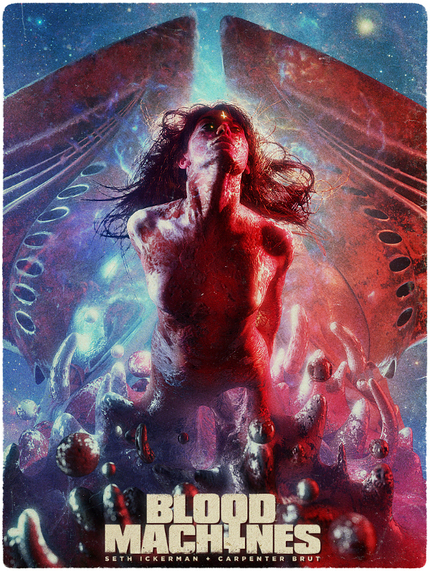 BLOOD MACHINES: The TURBO KILLER Sequel Releases New Poster!